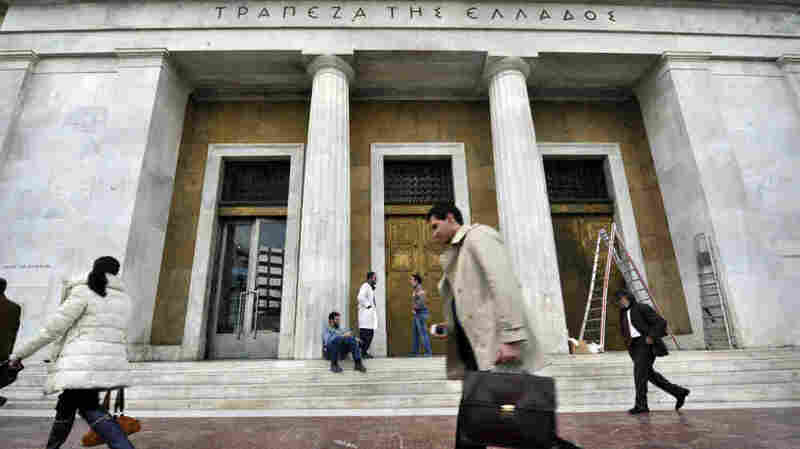 'Dire Consequences' If Greece Exits Euro Depositors in Greece are nervous about the possibility, and euros are being drained from the country's banks at a rate of up to $1 billion a day this week. The new election scheduled for June isn't boosting much confidence, either. But with so much at stake, is it possible for leaders to prevent an exit? 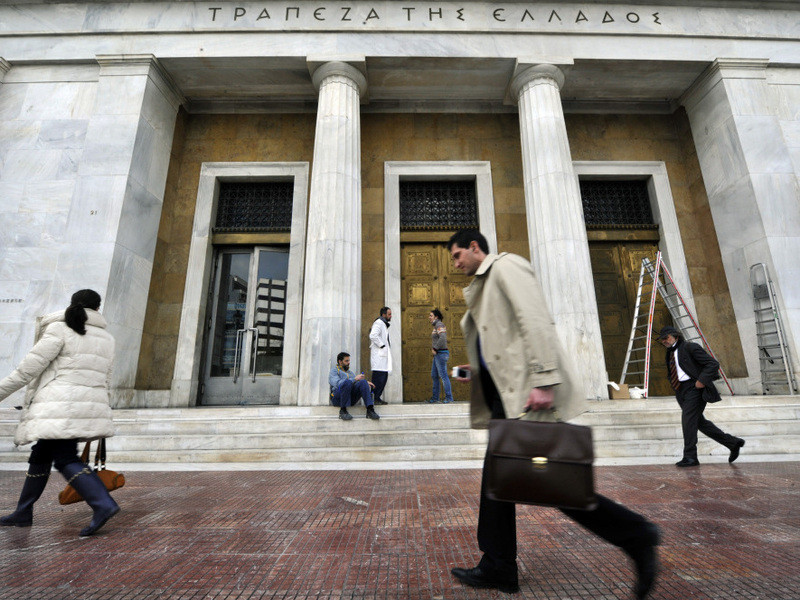 People walk past the Bank of Greece headquarters in Athens. Euros are being drained out of Greek banks at a rate of up to $1 billion a day this week. In the wake of the country's election turmoil, depositors are nervous about the heightened possibility of a Greek exit from the euro. If that were to happen, euros left in Greek banks could be worth much less than euros outside the country. Former International Monetary Fund chief economist Simon Johnson believes that with the Greeks unable to form a government because of victories by anti-austerity parties, there's an 80 to 90 percent chance that the country will exit the euro. Johnson thinks that very well could happen before the next election, to be held in June. "Greece is absolutely on an accelerated time scale now," he says. "Once people lose confidence in their bank deposits and believe that those will not keep their value, then just sitting around saying, 'Well, we'll sort this out in June,' is no kind of answer." Johnson, who's now a professor of economics at MIT and a fellow at the Peterson Institute for International Economics, says Greek depositors are making their calculations. "Today a euro is a euro, but tomorrow, the euros in Greek banks may be called 'drachmas,' 'new drachmas,' or they may be euros with some sort of restrictions attached to them," he says. "You're better off getting the cash — this is the view of the depositors. The depositors get the cash, then they can either hold the cash or put the cash in a bank somewhere else." Johnson says that with events moving so quickly, it's possible that escalating bank runs could push the caretaker Greek government into a disorderly exit from the euro. The authorities could be forced to halt the exit of capital in a number of ways. "They would put, likely, some restriction: You can only take out a certain amount; when you take it out, it has to be in a particular form," he says. Authorities could require people to take out a new form of currency that could have a lower exchange rate than the euro, Johnson says, "so that money is worth less than you thought it was just a week ago." This kind of chaotic exit from the euro could freeze up credit in Greece and create a cash-only economy, he says. Without credit, much business activity would grind to a halt, reducing the economy's output by 10 to 20 percent. Even more Greeks would be thrown out of work, and the chaos would harm the broader European Union economy, too. To reduce that chaos, Johnson says, Greece's EU partners would have to provide additional financial support for the country as it transitions out of the euro. "That would help you move toward a more orderly scenario," he says, "but that's obviously an intensely political decision and very much about [whether] the Germans have any patience for the Greeks at this point in time." Nicolas Veron, a fellow at the economic think tank Bruegel in Brussels and a visiting fellow at the Peterson Institute, is more optimistic than Johnson. "I do believe that it's still possible to prevent a scenario of Greek exit, which I think would have very dire consequences — not only for Europe, by the way, but also for the rest of the world in terms of financial and economic destabilization," says the former French government official. Veron says there will be great efforts both inside Greece and among its EU partners to keep Greece in the eurozone. He also says the country is not as close to leaving the euro as much of the current comment suggests. "There's a lot of brinkmanship both on the part of Greeks and Greek leaders and on the part of leaders from the rest of Europe and the partners of Greece," Veron says. But he says the economic costs of leaving the euro are so great for Greece, for the rest of Europe and for the world that officials will keep trying to avoid it. He says he's encouraged by comments made by German Chancellor Angela Merkel after her meeting with the new French president, Francois Hollande, Tuesday evening. Merkel said they agreed: "We want Greece to stay in the euro." But she also added that Greece must respect the conditions set in the bailout agreement in March.